Original Editors - Emily Betz from Bellarmine University's Pathophysiology of Complex Patient Problems project. 3.1 Pauciarticular JIA (PaJIA, Oligoarthritis) meaning "few joints"
JIA affects 30,000 to 50,000 children in the United States. For unknown reasons, it has been shown to be more prevalent in Norway and Australia. JIA occurs in children under the age of 16 and affects more than twice as many girls as their male counterparts. Girls with an oligoarticular onset outnumber boys by a ratio of 3:1. 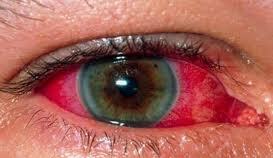 In children with uveitis, the ratio of girls to boys is 5-6.6:1. Among children with polyarticular onset, girls outnumber boys by 2.8:1. In striking contrast, systemic onset occurs with equal frequency in boys and girls. The mean age of onset is 1-3 years old. According to the National Institute of Arthritis and Musculoskeletal and Skin Diseases (NIAMS) and the National Arthritis Data Workgroup, in 2008 the US had roughly 294,000 children that had arthritis or other rheumatic conditions. Pauciarticular JIA (PaJIA, Oligoarthritis) meaning "few joints"
Rheumatoid factor positive (RF+) - patient tests positive on at least two tests at least three months apart. Subcutaneous nodules, cervical spine fusion, chronic uveitis, and destructive hip disease occur RF+ PoJIA. Rheumatoid factor negative (RF-) - patient tests negative on all tests for the RF. Morning stiffness, fatigue and possibly a low grade fever, along with joint involvement are typical. Characterized by a diagnosis of arthritis and psoriasis and at least two of the following: inflammation and swelling of an entire finger or toe (dactylitis), nail abnormalities, and a family history of psoriasis. See each subtype of JIA above. An aggressive course of medications is now accepted as the standard of care for JIA. A larger factor in the symptoms management with medications is dealing with the adverse side-effects. The main goals of treatment with medications are pain control, joint preservation (mobility and function), assist in the normal growth of the child, decrease and control other systemic symptoms of JIA and in some cases the disease is prevented from progressing. JIA is diagnoses according to patient and family medical history, symptoms, number of joints involved, lab tests and sometimes imaging. Erythrocyte Sedimentation Rate (ESR or sed rate): A nonspecific marker for JIA, it is used more to rule out other conditions and to aid in determining the classification of JIA subtype. An elevated rate can indicate inflammation. 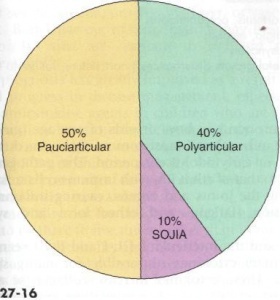 In systemic JIA the sed rate will be elevated, polyarticular JIA usually results in an elevated sed rate, and the sed rate is often normal in pauciarticular JIA. Anti-Nuclear Antibody (ANA): Detects the anti-nuclear bodies that are commonly present in those with an autoimmune disease. In pauciarticular JIA the ANA usually tests positive. In those with systemic JIA the ANA usually tests negative. ANA is more likely to test positive in diseases that could be a differential diagnosis for JIA (SLE or scleroderma) than it would in JIA. A positive ANA that is extremely elevated could indicate an increased risk of eye involvement and may indicate that JIA could progress to an adult-type SLE. Complete Blood Count (CBC): A nonspecific test for JIA. Anemia is common in children with JIA, therefore a low level of hemoglobin could be detected. White blood cells and platelets are often normal in those with JIA. Rheumatoid Factor (RF): Though more commonly found in adults with RA, a positive RF could be found in those with polyarticular JIA. RF is usually used to aid in classification of the JIA subtype. A positive RF could indicate the JIA will progress to adult RA. Anti-Cyclic Citrullinated Peptide (anti-CCP) Antibodies: Can be detected in healthy individuals before the onset of RA, and can predict the development of undifferentiated arthritis into rheumatoid arthritis. Imaging: Though imaging is nonspecific for testing for JIA it can show damage to the joint, fractures, tumors, infection and/or congenital defects all in which would help to narrow down or rule out diseases with similar signs and symptoms. Synovial Biopsy: Removal of a small portion of the synovial tissue from the affected joint can aid in determining the cause of the inflammation and synovial damage. Etiology is largely unknown. Some evidence supports environmental triggers, viral or bacterial infections or genetic predisposition. With further research there are hopes of identifying molecular biomarkers to aid in the diagnosis and treatment of JIA. The disease is accepted to be an autoimmune disease, which means that the body's immune system attacks it's own tissue, instead of foreign tissues. In JIA the body's immune cells and autoanitbodies attack the synovium. As a reaction to the attack the synovium becomes inflamed and irritated. This reaction causes the synovium to thicken and grow abnormally, this abnormal growth eventually will cause damage to the bone and cartilage of the joint and surrounding tissues. Researchers are beginning to believe that not all forms of JIA are autoimmune. Systemic JIA is now being more accurately defines at an autoinflammatory disease as opposed to autoimmune. This means that while the body's immune system is still over active, like in autoimmune diseases, the inflammation and immune activity is not caused by autoantibodies but rather by a different part of the immune system that when working properly should cause white blood cells to destroy harmful invaders. When this system is not working properly it causes inflammation, fever and rash for unknown reasons. 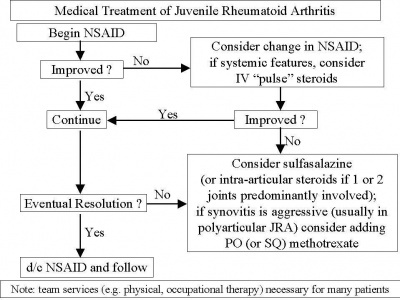 The goal of treatment of JIA is to stop or slow the progression of inflammation, relieving symptoms (swelling, pain, stiffness), improving function (maintain full/functional ROM), and prevent further joint damage. These goals are met by finding the correct combination of medications (listed above) that best benefit the child. Counselor or psychologist - aid the child and family in keeping their feelings about the disease and its treatment "sorted out"
Physical therapy is an important part of the treatment of JIA. It is important for the child to remain active and involved in sports and activities with their peers and friends. While pain may limit the amount of activity a child can handle it is important to encourage involvement during periods or remission and allow rest and symptom reducing therapies during periods of flare-ups. Regular activity and general exercise programs help to maintain range of motion in affective joints, build and maintain strength, maintain function and can even help with symptom reduction. Condon C, Gormley J, Hussey J. A review of the physical activity levels of children with juvenile arthritis. Physical Therapy Reviews [serial online]. December 2009;14(6):411-417. Available from: Academic Search Premier, Ipswich, MA. Hoffart C., Sherry D.. proquest.umi.com.libproxy.bellarmine.edu/pqdweb. The Journal of Musculoskeletal Medicine [serial online]. 2010;27:106-108. Available from: ProQuest Nursing & Allied Health Source. Document ID: 2096479861. Hutzal C, Wright F, Stephens S, Schneiderman-Walker J, Feldman B. A Qualitative Study of Fitness Instructors' Experiences Leading an Exercise Program for Children with Juvenile Idiopathic Arthritis. Physical & Occupational Therapy in Pediatrics [serial online]. November 2009;29(4):409-425. Available from: Academic Search Premier, Ipswich, MA. Fragala-Pinkham M, Dumas H, Barlow C, Pasternak A. An aquatic physical therapy program at a pediatric rehabilitation hospital: a case series. Pediatric Physical Therapy [serial online]. March 2009;21(1):68-78. Available from: CINAHL with Full Text, Ipswich, MA. ↑ Goodman, Snyder. Differential Diagnosis for Physical Therapists: Screening for Referral. 4th ed. St. Louis, MO: Saunders, an imprint of Elsevier Inc, 2007. ↑ 2.00 2.01 2.02 2.03 2.04 2.05 2.06 2.07 2.08 2.09 2.10 2.11 2.12 2.13 2.14 2.15 2.16 2.17 2.18 2.19 2.20 2.21 2.22 2.23 2.24 2.25 Goodman C, Fuller K. Pathology: Implications for the Physical Therapist. 3rd ed. . St. Louis, MO: Saunders, an imprint of Elsevier Inc, 2009.